The current measles outbreak in SW Washington has revived the debate of personal choice versus the common good. Which is more important in a democracy? Learn more in this week’s Current Event. What is the virus called measles? 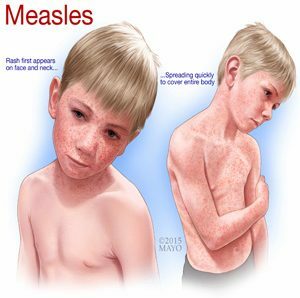 What are the effects of contracting measles? What vaccines are available to counteract measles? What advice do Health professionals give about protection from measles? What is the measles report from international health organizations? Is measles a more significant problem for third world countries? Why do some people object to the measles vaccine? Is this a “common good” issue? Why or why not? Where does the government’s right to require vaccinations come from? Is this a majority/minority issue? When do minority rights take second place to majority rights? How do we protect both majority and minority rights? What responsibility do citizens have to prevent illness that could spread to others? Do governments have the right to force citizens to be vaccinated? Why or why not? What might be the philosophical objections to vaccination?